Purchasing an annual membership is an important way to help out the community. The funds raised from memberships are critical for our community to continue offering the various programs we have, including the Skating Rink in the winter months and other family/community events like the Canada Day Party, New Year’s Eve Party, etc. Community memberships are due every November, and are active from November 1st to October 31st. The current cost for an annual membership is $30. A current community membership is required to cast a vote at community meetings including the Annual General Meeting (AGM) typically held in the late fall each year. All of our community events have discounted ticket prices for community members, so get yours today! We are thrilled to announce our new Retailer Membership Benefits program, available starting May 15th, 2018. 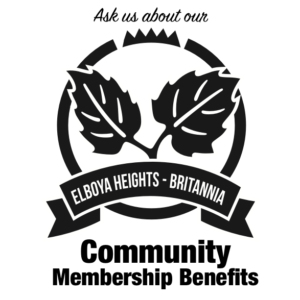 In an effort to encourage community members to shop locally, the Elboya-Britannia Community Association is teaming up with local retailers to provide current community members with special discounts and benefits! Look for the sign below at retail locations and show your new Elboya-Britannia membership card to get your special offer. (Note that if you have a current membership, your card will be delivered to you in the next few weeks). Are you a retailer interested in participating? Contact retail_liaison@elboyabritannia.com for more information. You can pay for your membership using any major credit card via PayPal. Please note: you DO NOT have to have a PayPal account, or create one in order to pay by credit card - the steps to the right will show you how. 1. When you have clicked the buy button, a new window will open with the PayPal login page. Below the login button is a button titled "Pay with Credit Card"
2. Once you have clicked that button you can fill out the credit card details and billing address as normal. 3. Add your email address at the bottom of the form and when you click the "Pay Now" button you will receive an email from PayPal with the transaction details. Check your junk mail folder if you can't see it in your inbox.